Oct. 4, 2017 6:30 a.m. The Canadian team will march into the opening ceremonies Feb. 9 at the Pyeongchang Olympics dressed in the patriotic red-white-and-black apparel, in what is a virtual starting gun for the Games. 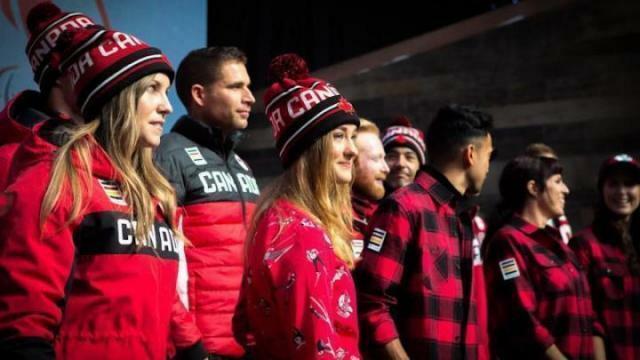 Fifteen athletes walked the runway at a downtown Toronto mall on Tuesday as Hudson’s Bay Co., unveiled its Team Canada collection for Pyeongchang. The patriotic apparel flaunts colour blocks of Canadian red and white, plus black. The opening ceremony parka falls to the mid-thigh and features “Canada” emblazoned across the chest in bold white letters, and a large white Maple Leaf on the back. Medal podium outfits feature a puffy red coat, while the athletes will march in the closing ceremonies in red and black softshell jackets. The collection also features buffalo check shirts, tuques and ball caps, and onesie pyjamas with a winter sport motif. The athletes said they’ll never forget the day they received their Canadian team gear. “It’s like Christmas when you open that up. It feels unbelievable to put this on, and really motivating,” said curler John Morris. The style and colours, said Hudson’s Bay Co. president Alison Coville, draws on the “strength and beauty of our country, the backdrops of the mountains and the white in the snow.” Canada’s kits are traditionally among the most popular at Olympic Games, and Coville said Pyeongchang will be no different. “We want them to put on those uniforms and feel they’re the best dressed at the Olympics, and we do believe that’s really been the case for many years now,” she said. Canadian athletes competing in the Paralympics, which open March 9, will be outfitted with the same kit, but with some modifications to fit athlete needs. Replica wear will be available at all Hudson’s Bay locations across Canada. The collection is priced from $10 to $114.99 for accessories, $20 to $55 for kids/infants, and $35 to $225 for adults clothing and outerwear.